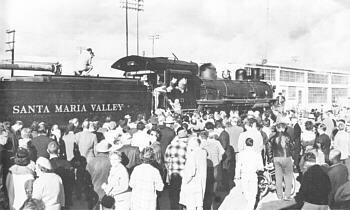 The final run of Santa Maria Valley Railroad's (SMVRR's) No. 21 Baldwin locomotive occurred on Saturday, February 24, 1962. The 26-page program for this momentous occasion is pictured at right - a recent acquisition for the Santa Maria Valley Railway Historical Museum's (SMVRHM's) collection. The pictures below are from this program. The crew pictured at left has a combined 108 years with "Old 21"! To the left of the coupler stands Allan Hancock, then President of the Santa Maria Valley Railroad (SMVRR) and the first and last engineer of Number 21. To the right of the coupler is Manuel Phillips, the first and last fireman of Number 21. At the time, the SMVRR had about 50 employees. Number 21 is a "mikado" steam locomotive, which refers to its 2-8-2 wheel arrangement. Number 21 is being restored by the Astoria Railroad Preservation Association; see the section, Baldwin #21, for a series of No. 21 pictures. According to the program, Hancock hoped that Number 21 would end up on display in Santa Maria near the downtown recreational center. But alas, that was not to be. Five Southern Pacific coaches were borrowed to accommodate the passengers. Railroad buff and entertainment magnate Walt Disney was in attendance for the day, and as a very special guest was one of the few who road in the locomotive cab that day. 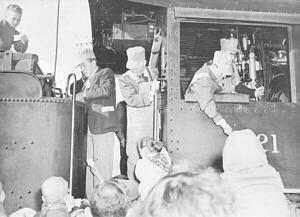 At right is Walt signing autographs on the tender for the railfans. Also among the guests of the day was Major General Joseph J. Preston, Commander, Stategic Air Command's 1st Strategic Aerospace Division, Vandenberg Air Force Base. Quite a few people, in addition to the 400 people on board, turned out to greet Number 21 as it entered the downtown yard area. See the enginehouse beyond the front of the locomotive. The day's trip originated at the western end of the SMVRR line in Guadalupe and concluded here in the yard which is today's eastern most active point on the SMVRR. "Rust in Peace" are the words of Mrs. Hancock lettered in gold on the huge floral wreath decorating the front of Old 21. There's another picture of Old 21 on the "Some SMVRR Steam Locomotives" page (second photo down).